In today’s economy your collectors need the best customer insights they can get. That means giving them the the right information at the right time in the right format. Forget working off of mainframe green screens, or bolted on front-ends–those tools aren’t made to provide maximum insights to your collectors. Your collectors need a Customer Insight Dashboard like the one below*. The dashboard shows, in detail, information that your collectors need to maximize their debt collection efforts. Across the top of the dashboard is the customer’s financial trend information and pertinent scores about their risk level and ability to pay you back. Along the left-hand side of the dashboard we provide your collectors with the ability to listen to prior interactions with the customer as well as access information they might use to locate a customer who is avoiding your calls. In addition, your staff could locate customer’s nearby your target customer for aid in tracking them down. On the bottom left-hand side of the dashboard your collectors have access to the customer’s most recent credit bureau data. This is a critical component to making sure you get paid first. We’ve parsed the information from the credit bureau to show your collectors which of your customer’s credit card lines they could use to balance transfer their bad debt off of your books and onto your competitors books. If a picture’s worth a thousand words, an image of the customer’s house or business might be worth $10,000. We find this information very useful to collectors in helping them figure out what makes each customer tick. Your collectors can then use their skills of persuasion and apply the information to help them collect the debt that’s due to you. Lastly, we show some recent transactions on the customer’s account. Seeing how they spent the money they owe you can also help your collectors be more persuasive in the collections efforts. A dashboard like the one above could be implemented in your system in a few weeks. 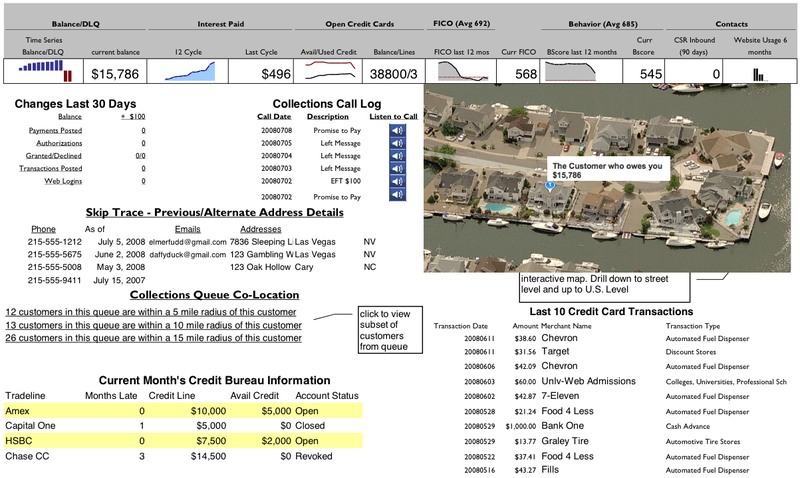 The dashboard itself is all done in Excel 2003 (2007 works too) with a $250 add in. *The data presented in this dashboard are not real. They are provided for illustrated purposes only.